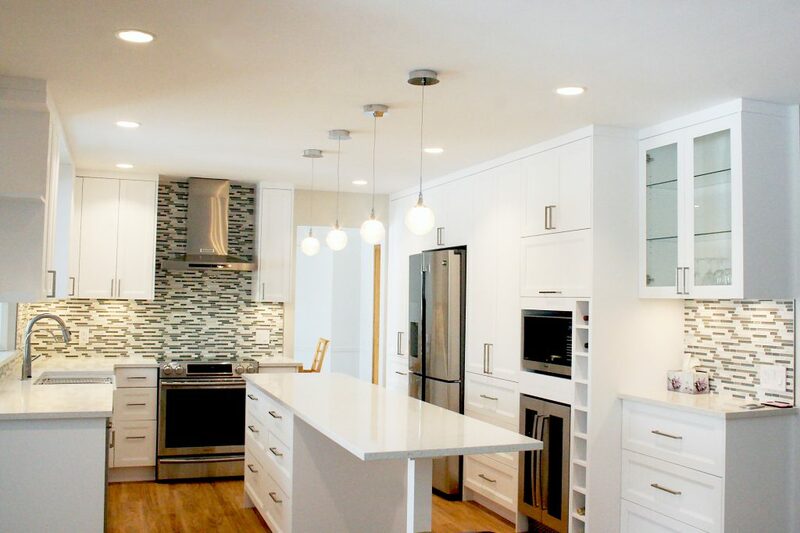 Walk through the front doors and be wowed by the beauty in the pristine, bright home renovation. 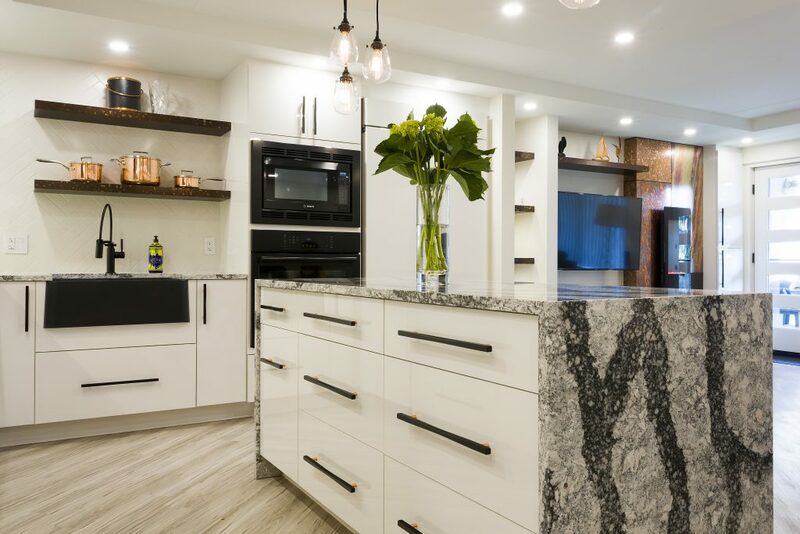 Luxury finishes including luxury vinyl tile throughout, 24” x 48” polished tile on the fireplace buildout, Iceland mosaic tile selected for the kitchen backsplash and a gorgeous Caesarstone on the island and counters. 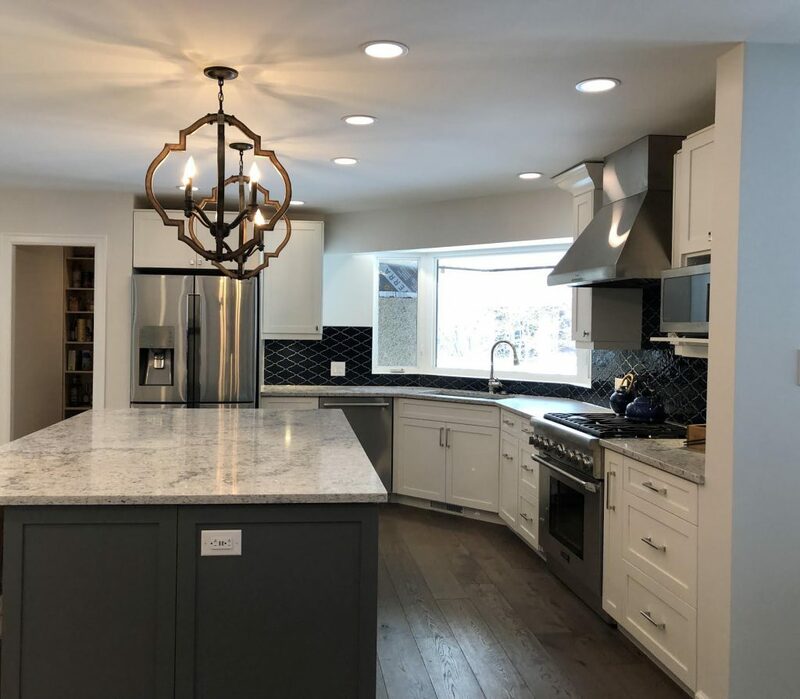 Add to the reflective bright feel of the space with all new stainless steel appliances and a classic grey with pearl finished casings and baseboards and this whole home renovation is brilliant and inviting! 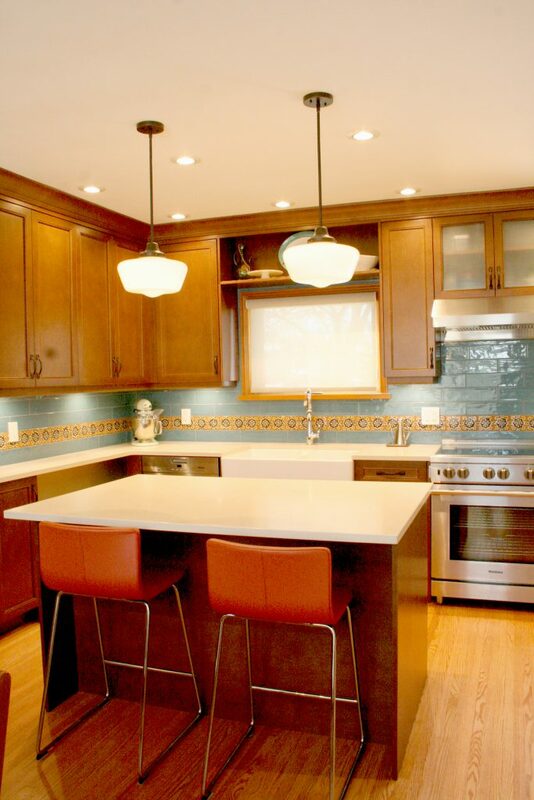 This client wanted to modernize the dated kitchen and adjacent spaces. In addition, they wanted to reconfigure layout to have enough dining area for their seven adult children and partners; 16 in total! This home is in a condo complex and so finding solutions to address the homeowner’s goals without changing the exterior structure was huge challenge. We reworked the laundry area, removed the fireplace and several walls. We replaced kitchen cabinets and lighting. We added new lighting, two fireplaces and a built-in buffet for serving guest. The result is a modern space and table to seat 16! Mission accomplished! 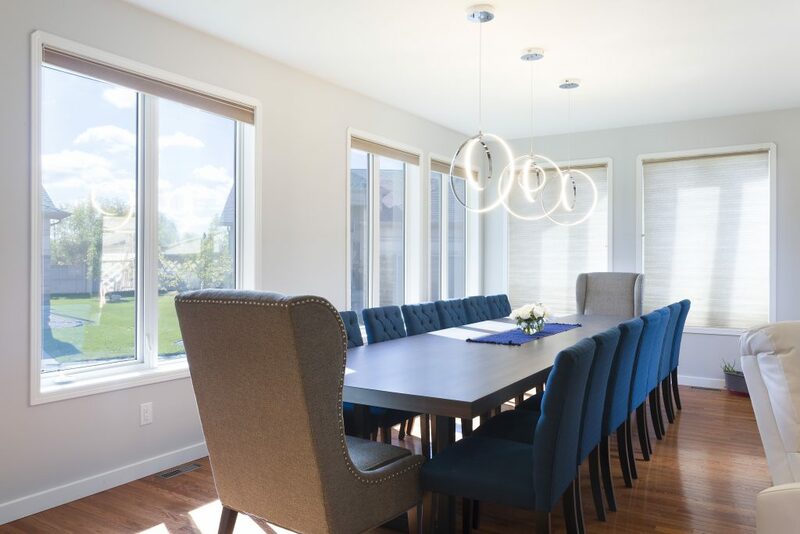 With a love for the area and not wanting to move from it, our customers decided to invest in the existing house and design it like they’ve always dreamed. The largest part of the renovation was flipping the kitchen from the front of the house to the back. Changing and moving windows and removing and moving walls were also part of the process. A custom kitchen was installed. New hardwood and tile floors and fireplace surround were added. In the end the customers have their new dream home without having to move from the area they love. A condo reno presents some unique challenges but with challenges come the opportunity for unique and brilliant solutions! This 5th floor condo got the royal treatment! Features include: large island with a stunning double waterfall countertop, a dramatic custom built black and brass hoodfan, white herringbone tile backsplash, Farmhouse style black sink in kitchen plus unique designed sink in ensuite, custom entertainment display wall with a vertical electric fireplace, flanked with stunning copper veneers to create a focal point toe tester in the master ensuite and a beautiful barn-style door in the entry. What do you do when the kids leave home and you’ve got all that extra space? Design and build that amazing den you’ve always wanted? Add a game room or maybe a library? Yes, yes and yes! This two story plus basement reno features a large peninsular counter with extra seating & storage; custom banquette seating in the nook; a unique custom entertainment display wall with high gloss lacquered doors, touch latch hardware; a hideaway daybed in their new den; a transitional game room/library and a gorgeous three piece bath, all integrated with durable hardwoods and a bright grey paint throughout. 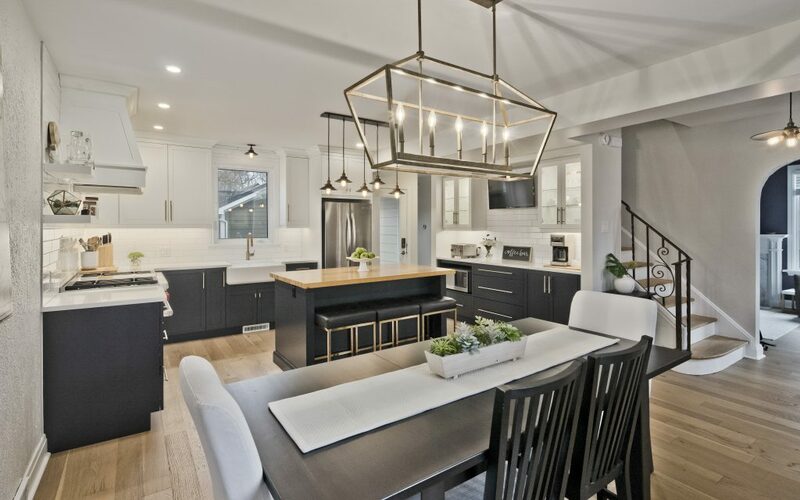 Our client’s goals were to modernize the finishes, add amenities for entertaining and replace the builder basics while going for a new modern look. We removed half walls and added more flooring area to the eating space which allowed for large floor to ceiling pantries. 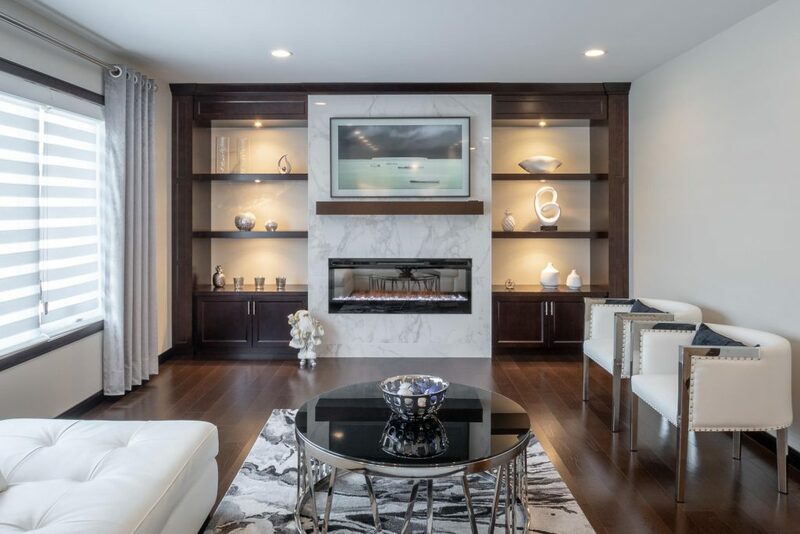 We replaced exterior doors, vanities in three bathrooms, kitchen, fireplace surround and built-ins, railings, all lighting, flooring and baseboards. We added new lighting, bookshelves and a serving area. Our chosen palette of white, walnut and graphite accent is visible in every direction. The client says it feels like a new home within their existing home! This 1940’s heritage home has been given new life and new attitude with a modern makeover that’s a feast for the eyes. The layout and style showcase unique features designed to fit with the client’s life requirements and include: a symmetry of the overall design, walnut veneer cabinets, reeded glass doors, pennyround tile with black grout, an orange ceiling in the powder room, a Tiffany blue ceiling in a bedroom, a self-serve coffee station, and perfectly cultured stone on the exterior and a laundry shoot from the top floor to the basement. It’s a one-of-a-kind modern makeover. This client wanted to turn their investment property into a stylist home for their growing family. From our first visit, this gutsy client said, “feel free to be creative”, with a wink, wink! The home had been a great rental but needed some real investment to get it in line with today’s modern lifestyles. Our scope included moving a set of stairs, deleting an exterior door and window, new kitchen, new bathroom, the new flooring throughout, new lighting, new stair railings, baseboards, and trim. We added a dramatic wood ceiling, bulkheads, new lighting, fireplace feature wall with trendy barn door. You know it, or have at least heard of it – school’s out, race home grab a bite, off to soccer or hockey or dance. Sleepovers, birthday parties and all the while, Benji’s racing around your feet. It’s a busy life and one that deserves the best family friendly kitchen. 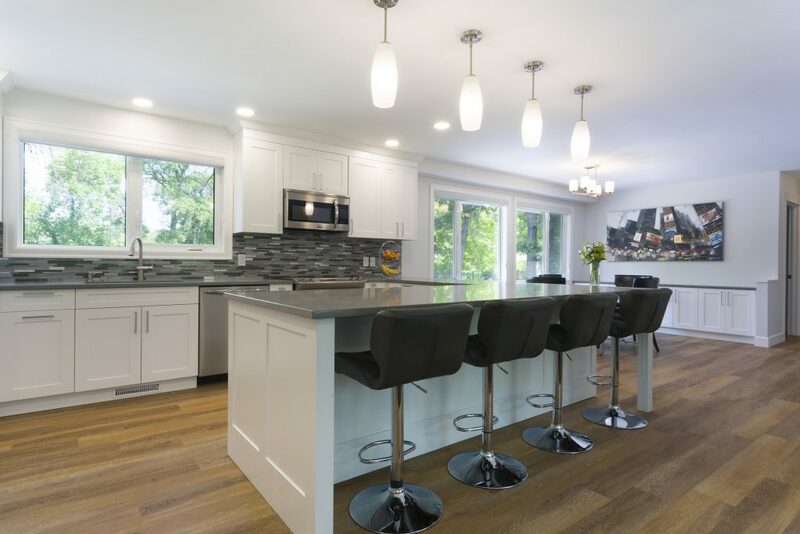 This reno transformed a small dark kitchen into one with tons of storage, clean lines, peninsula seating, great views of their river property, efficient design for fast meal prep and clean-up. 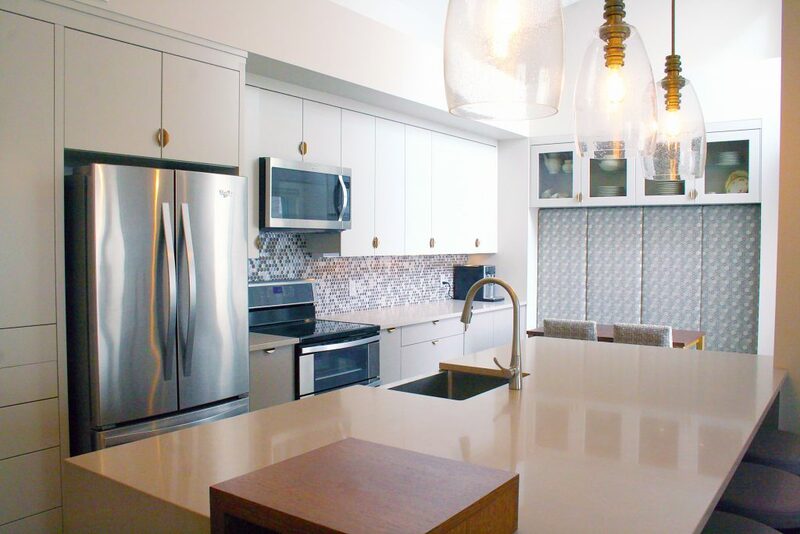 Additional features include: extra large refrigerator, soft close hinges on cabinets, luxury vinyl flooring, quartz countertops and ceramic tile backsplash. This 1950s home was an extensive renovation inside and out. 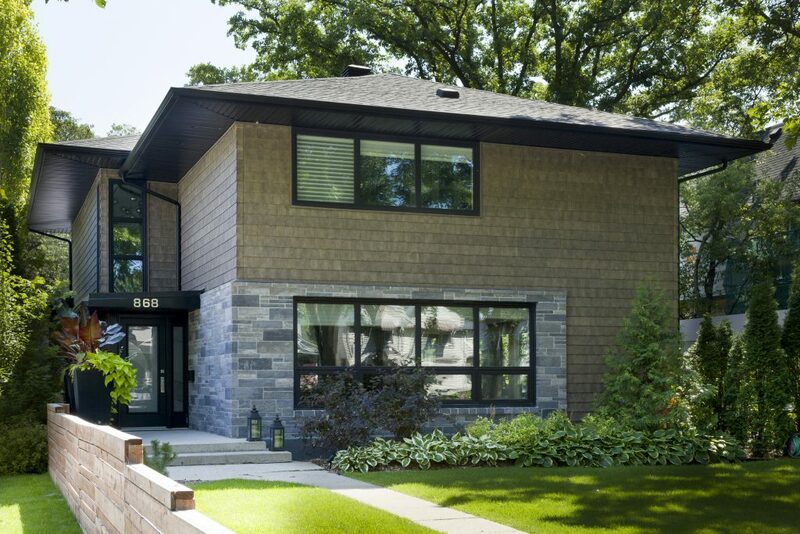 With the goal of turning this typical River heights bungalow into a very unique open concept home, our clients had easy access living in mind. The reconfigured main floor feels much larger than the 1100 sqft footprint. 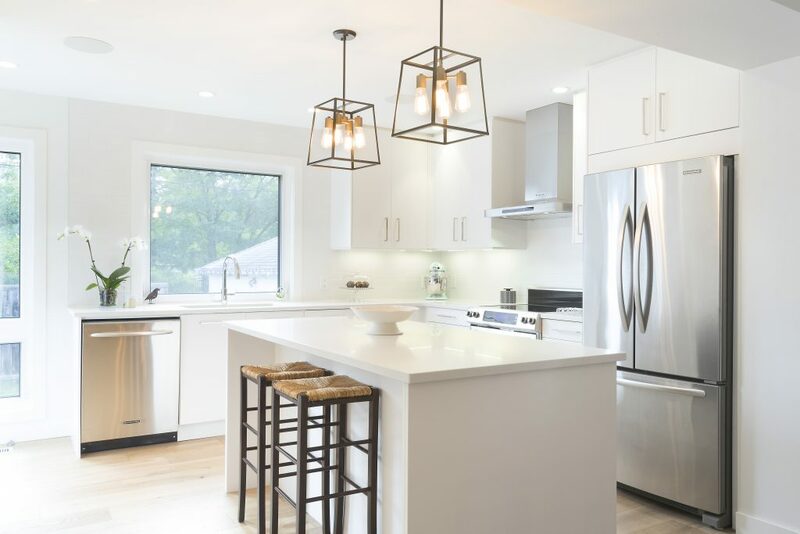 The home includes premium finishes throughout, including tiles, heated floors, 3/4 hardwoods, Quartz countertops, solid wood cabinets and mill work. The home features a large kitchen with center island , Master bedroom with walk in closet and huge en-suite/attached laundry, 2 other bathrooms, a wide open basement for entertaining and a guest bedroom. The owners of this original 1940’s, one and half story home were in need of an update to match their exceptional, transitional taste. 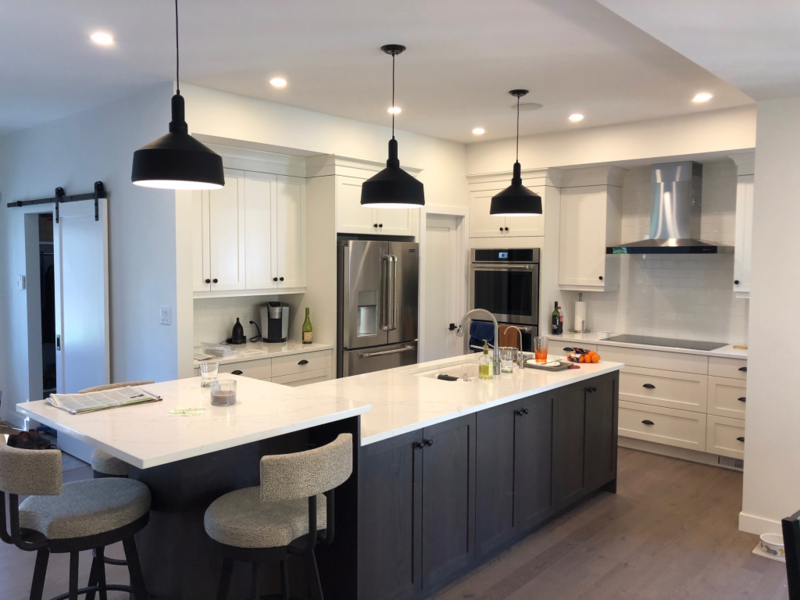 So to give them the house of their dreams, we updated the kitchen, added a master bedroom and en-suite addition with built in closets, and opened and reconfigured the main floor with a new powder room. 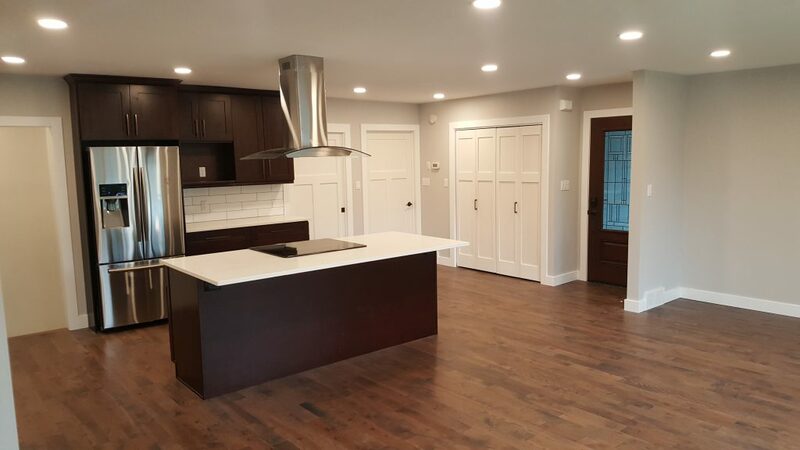 To match the new hardwood floors throughout, we installed two-tone cabinetry, quartz counter-tops, and chef style appliances in the kitchen. The en-suite was refurbished with a custom tiled shower and heated floors, displaying the open modern aesthetics beautifully. 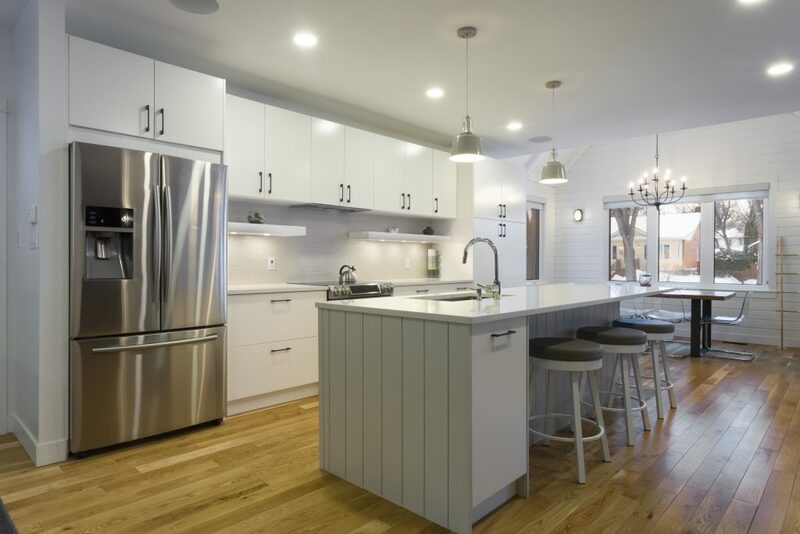 The renovation of this 100-year old duplex into a single family dwelling was HGTV worthy. Beyond typical challenges associated with renovating a century old home there were unique challenges with design flow and the desire of the client to reuse, refurbish and use reclaimed materials where possible to infuse the home with the style of the era. The result? An expansive home complete with quality craftsman finishings like; custom built radiator cabinets; reclaimed brick on the floor to ceiling fireplace surround in the library; stunning era style archways throughout and rich refinished hardwoods that you won’t find in any store! The clients had long felt that their 820 sf bungalow had been bursting at the seams with a growing family of four. After exploring options in their area to build new or buy a bigger home the clients were left feeling defeated, not only by the price tags but the quality of craftsmanship. 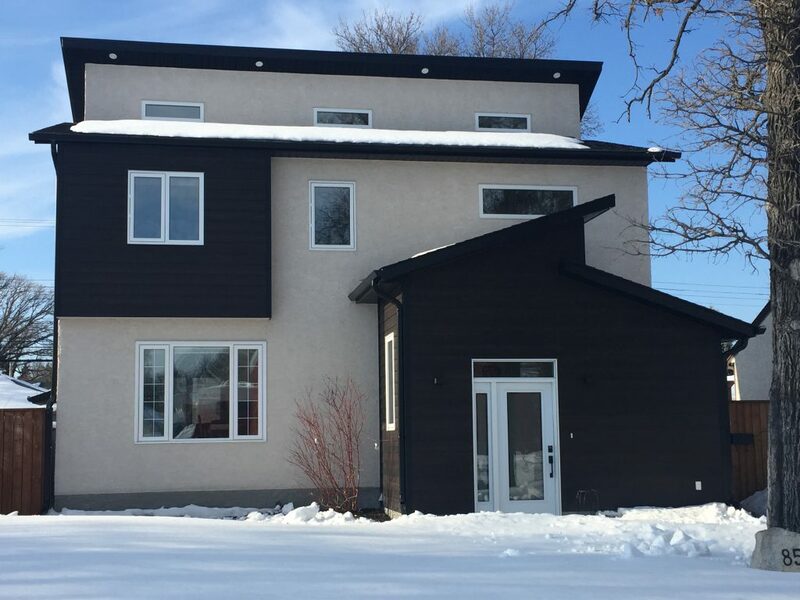 The decision was made to add a second story and front entrance to their existing home using a certified builder and renovator. It was a pure collaboration that fulfilled the clients needs and desires, not only for custom finishes but to remain in their chosen area. A 2 story river heights home in a fantastic location had a completely dated interior with multiple structural, heating, and cooling issues. The project was designed and built to bring the home back to life and to suit the needs of this family for the next 25 years and beyond. Along with the complete interior renovation, we added some additional space to the second floor to allow for a master ensuite and walk in closet. This riverfront property with its 5-Star river views was an investment the owners wanted to enjoy not only from the outside, but from the inside of their home. 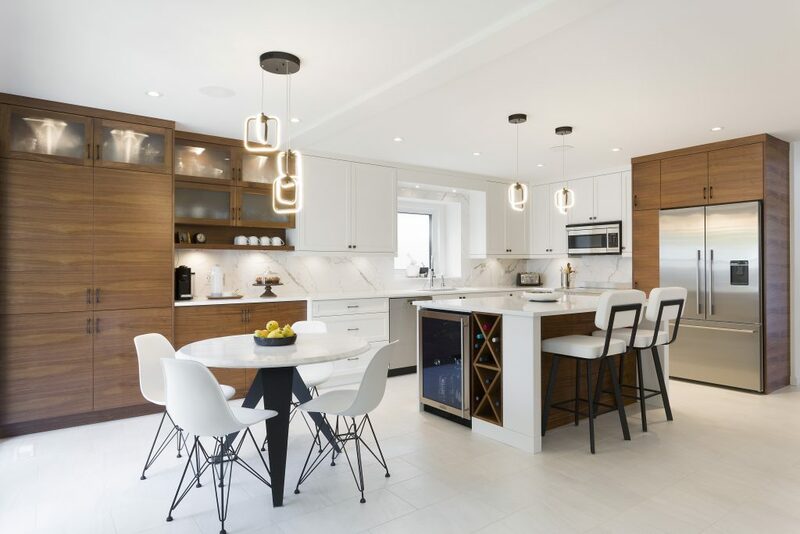 To achieve this the new structure was engineered and constructed to accommodate gorgeous floor to ceiling windows in the kitchen, dining, great room, master and ensuite. 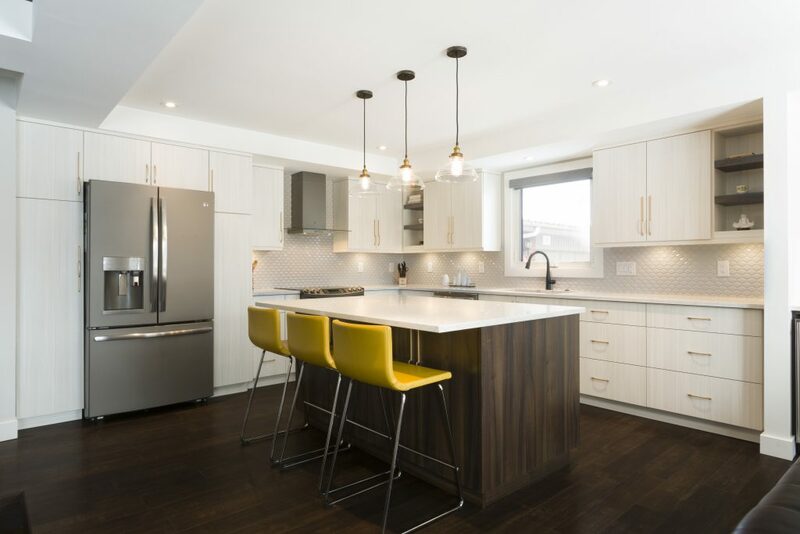 Other features of this ‘Happily Ever After’ home include: enhanced hardwood flooring in the Maple Antique series, refinished wood beams in the great room, custom wine cabinets, three-sided fireplace and free standing tub in the ensuite, large walk-ins, open shelving and so much more! Nestled into a curve of the Red River, Riverview is often described as Winnipeg’s “village” area. This mature, residential community is bordered in the north by the Red River up to approximately Jessie Avenue. Most of the neighborhood is made up of beautiful character homes. This 1926 modest bungalow was purchased with the intention of rebuilding it. We designed and rebuilt this home to fit the needs of the family as well as blend in with and respect this beautiful community. Now sits an efficient 1750 sq foot 1 & 3/4 story ready to live another century. This Custom built home in South Headingley has a great layout and curb appeal. The interior was, however, quite dated. The owners commissioned Lynn Fenwick Interior design to give the home a comfortable modern look. All rooms in this large bungalow were updated with new flooring, new interior doors, casings, baseboards and paint. All millwork in the Kitchen, breakfast nook, living room, dining room, bedrooms and all bathrooms were redesigned and replaced. The plumbing fixtures including bathtubs, showers, sinks, toilets and faucets were replaced. All lighting fixtures were updated to modern energy efficient LED. Downsizing to Norwood Flats, the 3 kids were ready to leave and the clients no longer wanted the high taxes of a suburb. They found a storey & 1/2 house in “the Flats” that had been renovated in the 80’s, need some TLC and a bit more space. The location and yard is what made this property stand out. 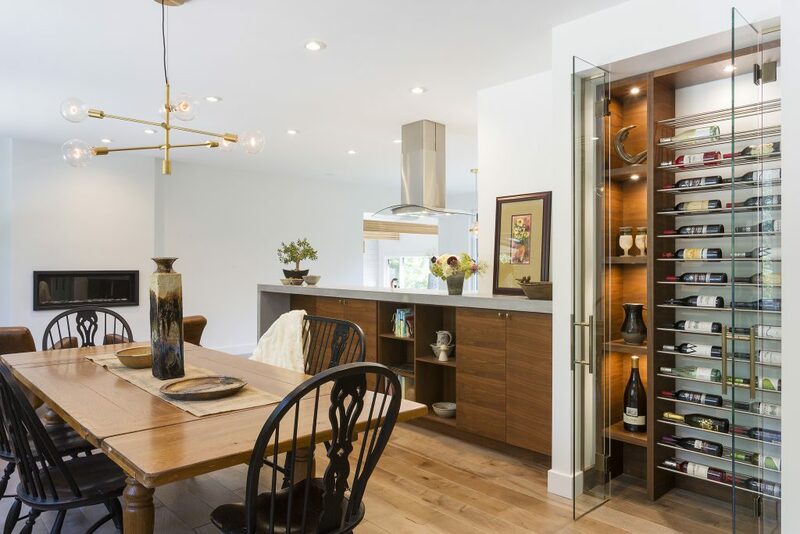 A large main floor addition with a sunroom, mudroom, great rear entry and an large kitchen addition allowed us to install a steel beam and open up the living / dining kitchen into one fantastic open living space. A tired storey and 1/2 in Riverview needed an update and more room. The second floor was removed, 3 full bedrooms, 2 full baths added. The main floor had the original master bedroom reconfigured to a mudroom entry, stairs to basement flipped to allow for more room in the kitchen. Bumpouts in the kitchen & 2 storey for the living and master bed added just enough space on the main floor. A covered back entry and front porch completed the project. The home is on a park / schoolground in Lindenwoods making the backyard seem to go forever. The home was built in the 1980’s with a traditional main floor layout, separate rooms everywhere. 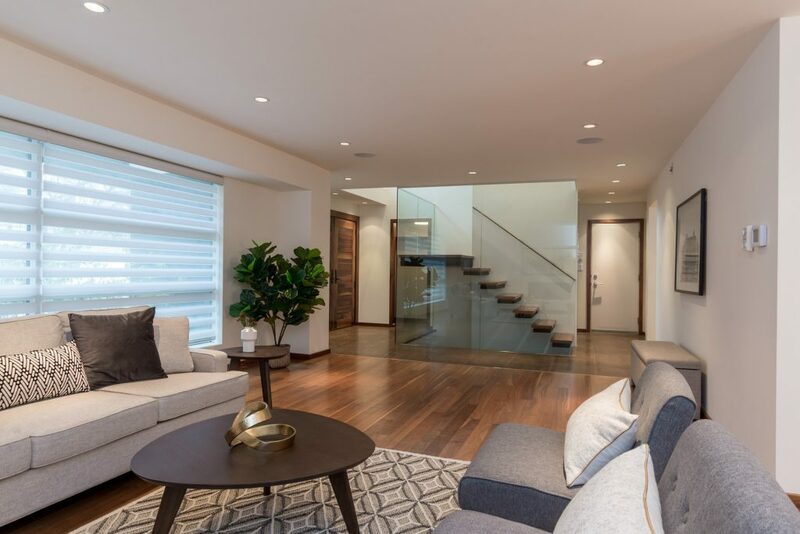 To take full advantage of the yard, the main floor was opened up, with the sunken floor raised to the same level as the kitchen to allow for easy flow and furniture placement. The original mudoom / bath office area was reconfigured to bath, laundry & rear entry with a second set of stairs to the basement, great for kids & hockey equipment. Not one space was overlooked, as we transformed this dated, fire damaged home, into the home of our clients dreams! From the sweeping solid oak stair case that greets you in the front foyer, and the new chefs kitchen complete with quartz counter tops and stainless appliances, to the engineered hardwood flooring, custom wainscoting, and the endless tile that seemingly goes on forever in the spa like ensuite, every detail of this home truly leaps out at you as if from the very pages of a magazine! The new layout of this home displays a modern farmhouse style that will constantly have your eye drawn to detail! Layout aside, the finishes took this home from sad to glad. 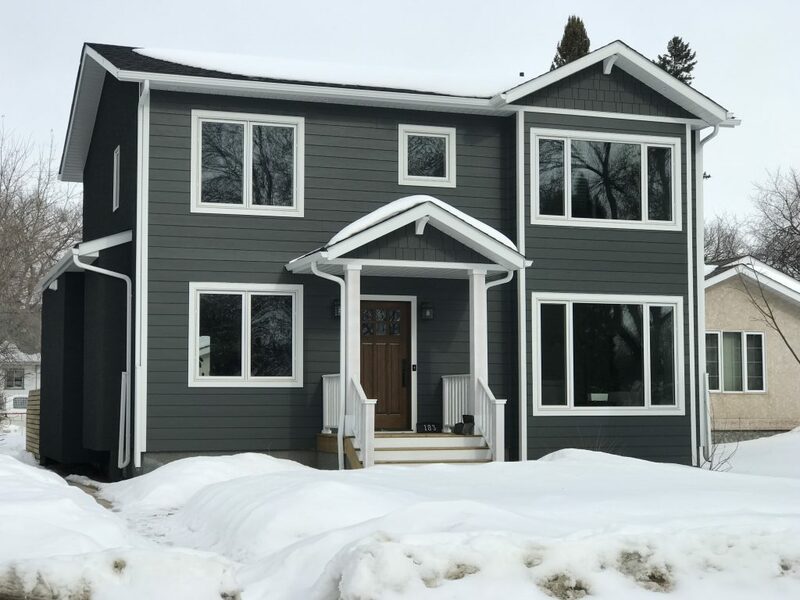 Renovations include mud and laundry room, kitchen, bar, pantry, powder room, living and family rooms, master and ensuite and new barrel roof ceilings. 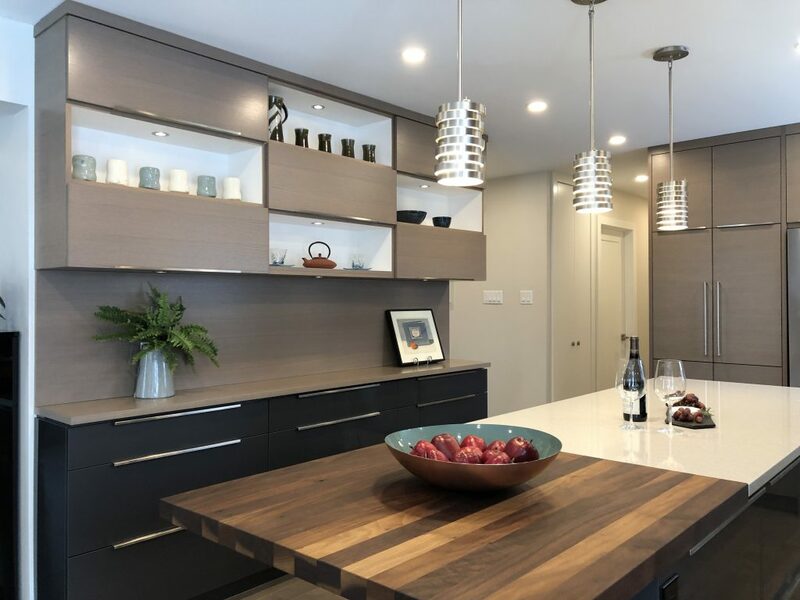 Engineered oak hardwood was installed throughout common areas and painted maple and stained oak shaker style door cabinetry throughout set the tone. A custom barn door, high end glass tile, and exposed burl oak structural wood posts really bring this build to the finish line strong. Walking through the custom front entry, your eye is immediately drawn to the floating stair case that spans all 3 levels of this home. This stunning feature truly needs to be seen to be fully appreciated! 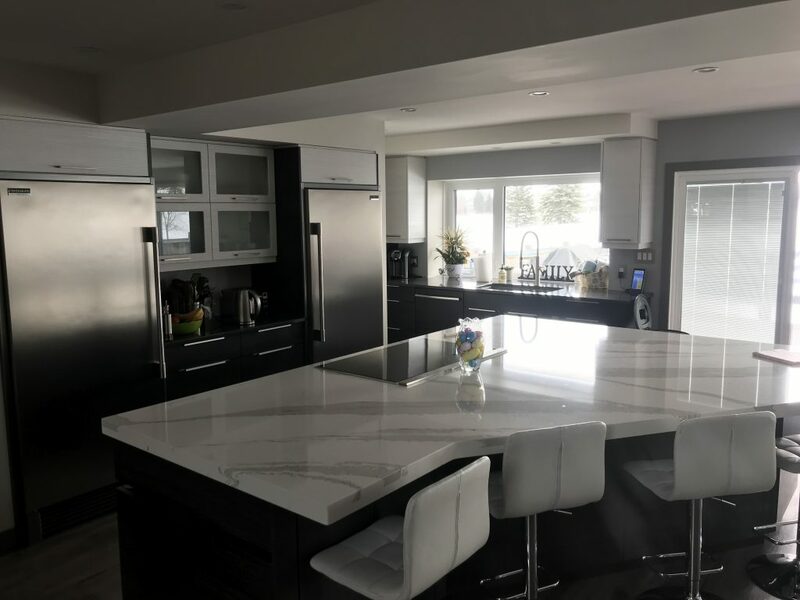 The new kitchen boasts custom walnut cabinets, an over sized island, and new stainless appliances, allowing us to create a space that was not only functional, but eye catching as well. 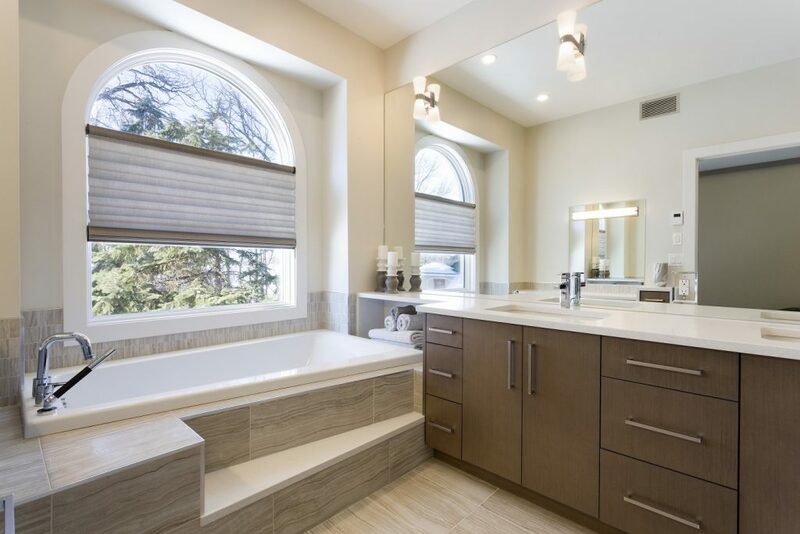 The ensuite bathroom incorporates heated tile flooring, custom vanity with quartz top, and a luxurious free standing tub. Existing flooring and trim was replaced throughout, making this home truly one of a kind!